A beaded necklace made of seed beads, and flower wire. Its name come from a place in Istanbul called Grand Bazaar where you can find almost every kind of spices in the world and more. All the colorful beads in this necklace reflect that unique world. 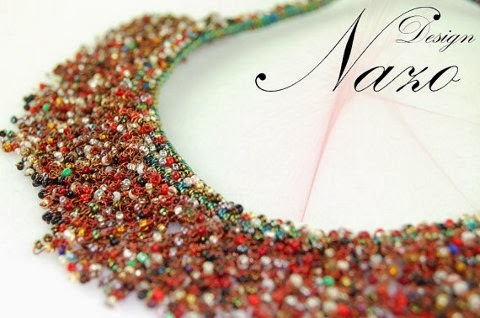 This necklace is a unique design of Nazo Design®. As it is said at the title, this necklace is one of a kind. It took 1 month to produce 1 of this necklace. * I did string every single bead of this necklace to very soft wire and made very small, really tiny knots to capture those very tiny seed beads within the hoops and then add more than 2000 of those beads together to form this necklace. * Although I used wire to make this necklace, it is a very soft wire, which is called as "flower wire" in Istanbul. This is why, on the contrary of what we observe in other types of wires, the texture of this necklace is very soft. * Each strip of wires can move free from the others; however, each of them attached to the main strip, the neck part of the necklace, which is beaded by using another technique (herringbone). As you can see from the photos, I did not use any metal component to attach the two ends of this beautiful necklace together. I rather beaded that part too. * To see the length of the necklace please refer to the fifth picture from the top. * I used fishing line to bead the main part of this necklace on the contrary to regular beading thread. Beading the necklaces with fishing line makes them much more durable. * I used size 11/0 seed beads and flower wire. * Please keep your necklace in its box when you are not using it. This necklace is made in a smoke and pet free environment. Your necklace will be shipped with a gift box where you can keep your necklace when you are not using it. Necklace is created by Nazo Design®.